Steve Towers has once again put pen to paper to present us with strategies that organisations may adopt to achieve success in today’s ever-changing business landscape. In suggesting that today’s businesses are working with new rules and within a new environment is no surprise to any of us who are over the age of 30. The question is how to mould organisations into a way of thinking that is aligned with today’s consumer to ensure “successful customer outcomes” in all business and consumer interactions – hence, an “outside-in” philosophy. The book questions the approach of traditional business processes, noting that just because we’ve always done something a given way, doesn’t necessarily make it right. And even if we perceive that we may be doing things ‘right’, are they really the right things to be doing in the first place? While these concepts in themselves are not ground-breaking, the idea of fixing the causes of work instead of massaging a process to compensate for an outcome (effect), is one of the fundamental mind shifts that is presented. We live in a world where consumers have access to more information than they can ever possibly desire. They can easily be, and quite often are, more informed than the customer service person who supplies them with whatever product or service they are sourcing. Steve suggests that, as suppliers, we need to step into the shoes of these ‘pro-sumers’, our customers, to understand their true need, rather than their perceived ‘want’. If we understand who our customers are, their expectations, the process they think they are involved with, that everything we do impacts the customer, and what their real needs are, then we are capable of delivering ‘successful customer outcomes’. The book is an easy read, stepping us through a series of questions to make us look at things from our customer’s point of view. Beyond this, the framework presented provides a foundation for organisations to question their current approach to the way their business processes are implemented. It suggests that in using this framework, simultaneous improvements can be achieved in revenue, costs and customer service – something considered a lot more challenging to achieve using previous business process improvement strategies. After all, “we can’t solve problems by using the same kind of thinking we used when we created them” (Einstein). The steps within the presented framework are backed up with many examples, some a little more contemporary than others. While the concept of a customer centric organisation is not new, the framework presented here is the first I’ve seen that is sound, logical, comprehensive and practical. The list of companies cited as taking an outside-in approach is impressive, with many well known brands mentioned. Most notably these are companies that survived and even grew during the global financial crisis. In a time when we are overloaded with information and complex challenges, I find the concepts of “Outside In” both pragmatic and refreshing. More than anything, it suggests that we need to remove our blinkers, unlearn our understanding of customer satisfaction and widen our horizon to encompass a much more comprehensive total customer experience. Every organisation only exists to serve its customers. 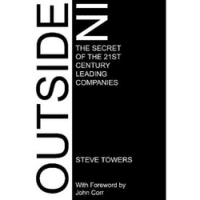 If you work in an organisation, and particularly if you are in a position to shape the processes within an organisation, then I would recommend that you read “Outside-In”.